As a trader in the export of live marine fish and invertebrates I often meet clients with outrageous demands for rare fishes. I owe it to my clients to provide them with their choice of fish but I also owe them an explanation why I consider some demands beyond limits. The business of ornamental fish goes well beyond beauty and attraction. It includes some in depth knowledge of the fish to keep, how to keep and the tank mates to keep it with. Some pose more challenges than others while others are a stroll in the park. To this point a few fish are considered to be rare in terms of demand as few people can undertake the challenge of keeping them. Most aquarium fish can only re populate in the wild. There are some which take longer than others and therefore difficult to find. This makes them rare only during a particular time. 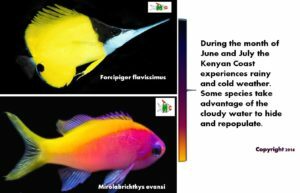 Re population is affected by the nature of fish and different weather patterns. The faster a fish re populates the easier it becomes to deliver it. We try to advice all our clients on this. Extensively, during the months of June and July the coastal regions of Kenya experience some cold weather and rains. 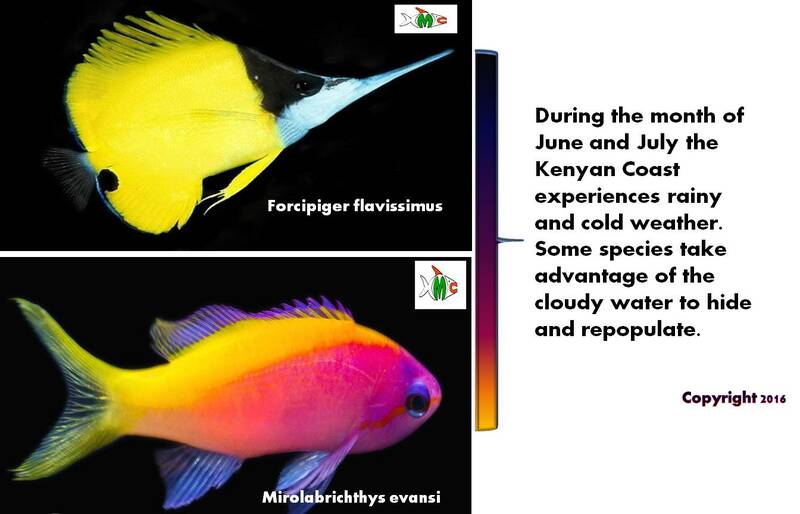 Certain species like the Mirolabrichthys evansi and the Forcipiger flavissimus take advantage of the cloudy waters to hide and repopulate. During these months they can’t be found with ease but when the waters are calm and clear (From October onwards), they will be littered everywhere. This is closely related to repopulation however it stands as a point in itself. Some fish are quite migratory. They can only be found in our waters in different seasons of the year. 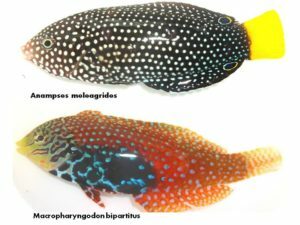 This kind of rare fish are only to be acquired when available before they disappear again. A good trader will know this vital information and will prepare his customers for the availability of the fish before they migrate to re populate again. Hybrids command such a handsome price in the industry. The off springs are rare because they come from a cross breed of two different species. One such crossbreed is between the Zebrasoma gemmatum and the Zebrasoma scopas. However the love child between the two species fails to live to its glorious reputation. This is majorly because both species don dark colorations in nature. It is sad that despite the hybrids affluence and rarity, it is considered meager and dull compared to a pedigree Zebrasoma gemmatum. It takes a lot of discipline and maturity to run a full time ornamental fish export company. The knowledge of how to care for each species demands while in the facility requires patience. An experienced dealer will acknowledge that wrasses are by far the most delicate species that easily succumb to stress than most saltwater fish. System transition- wrasses are particularly vulnerable during a system transition. The handling between when they are transported from the ocean to the export facility should be fast and smooth. They should be acclimatized progressively to avoid temperature related stress. Aggression- must be kept with peaceful tank mates. Basically non-aggressive fish. Feeding- You need to feed them several times a day. Wrasses are quite active and energetic. Tank set up- All wrasses are jumpers. Wrasses in general hide in sand and small rock substrates. – Instinctively they are not used to the surface and if tanks are not covered they might leap out of the tank. Note: Generally it is advisable for traders to include sand in holding tanks for wrasses (to eliminate stress) but most traders disregard this, arguing that sand makes it impossible to observe the fish health condition thereby compromising the fish quality.